Angela Maria Kelley, immigration consultant, visited Albion from March 25 to 27. With her experience as the senior strategic adviser for immigration at the Open Society Foundations and Open Society Policy Center, she held open dialogue discussions, class lectures and a public speech on immigration realities. 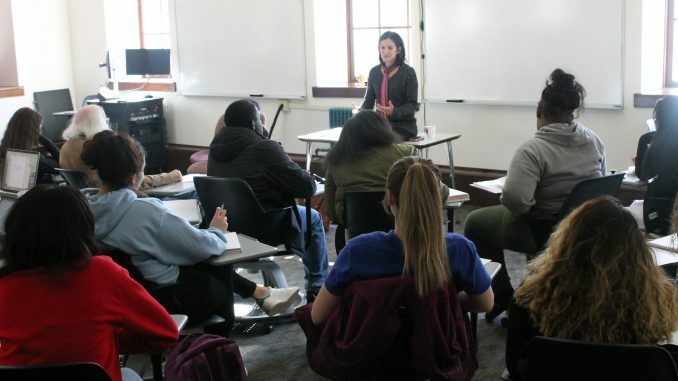 Kelley visited as a Woodrow Wilson Fellow, a program that sends experts on a host of topics to college campuses through the Council of Independent Colleges. Kelley initially worked with clients of domestic violence but shifted to clients who fled their war-torn countries to the U.S. to apply for asylum and become naturalized citizens. Kelley found immigration through her work with domestic violence cases. Often, refugees, usually women, stayed in relationships because their abusive significant other held their right to a green card, visa or work permit. She couldn’t help her clients without encountering immigration conflicts. Kelley aims to change the legislation on immigration policies that have not been updated since 1990. Kelley found it frustrating representing clients with strong legal cases but still losing the battles. During the 1980’s El Salvador civil war, the United States sent billions of dollars to the country hoping to prevent the spread of communism. The money was sent for economic and military aid that led to a powerful Salvadoran army committing violent crimes on innocent Salvadorans who fled their country for safety. Kelley said most refugees experience threats by violent acts — such as murders, maiming or kidnapping — personally or on someone they know. “I would lose those cases because the person was from El Salvador,” said Kelley. Kelley learned the disparity in her cases because identical cases from one nation would not receive asylum while others wouldl merely because of their non-El Salvadoran nationality. If the client was from El Salvador but from a different background, such as Nicaragua, the client would have a better chance at winning asylum in the United States. Hoping to change immigration policies, Kelley, along with other advocates, are urging the federal government to update what they consider the broken Comprehensive Immigration Reform Act of 2007. Her first step to modify the Comprehensive Immigration Reform is to help immigrants without papers reach the path to citizenship. On average, undocumented immigrants in the U.S. have stayed for 13 years and most arrived when they were babies, she said. These immigrants are known as DREAMers. Other immigrants include refugees who arrived from war-torn countries who have received U.S. protection and work authorization but not legal citizenship. Kelley also strives to update the legal immigration system for immigrants with diverse work skills and long backlogs to stay closer with their families in the United States. For example, if Kelley’s daughter, who was born and lived in La Paz, Bolivia and Kelley is a U.S. citizen and tries to bring her over, that could take about seven years. But Kelley’s 18-year-old wouldn’t take “any time at all,” she said. Today, the United States has the same number of visas it had in 1990. “So it’s just bizarre that we’re such a smart country, but yet we have these laws that don’t make sense for the last century, much less even in the century before,” said Kelley. Kelley also works to change immigration enforcement to maintain strong borders and border security. As Kelley says, the U.S. government spends nearly $18 billion on immigration enforcement. Only $14.5 billion is the budget for all the federal law enforcement agencies, including the Drug Enforcement Administration, Secret Service and sheriffs. “It’s important because we do want to keep out people who mean to do us harm and we want to keep out drugs in this country,” said Kelley.